Christine Berrie is a Scottish artist and illustrator and has a real knack for detailed drawings fetishizing technology. 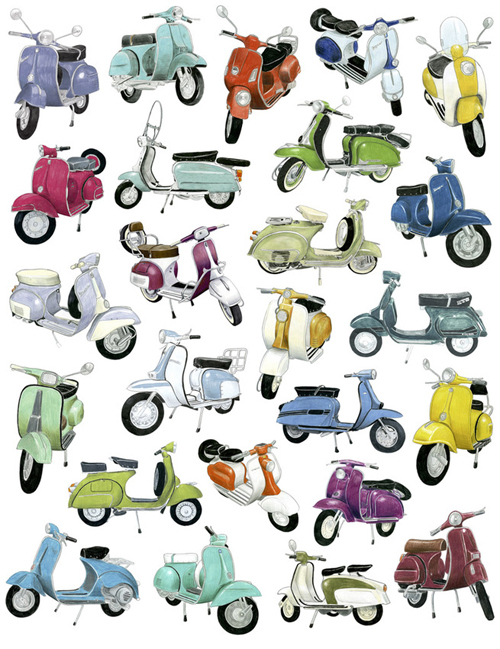 In this print she captured the vast assortment of vintage Vespas, Lambrettas and other motorized bikes (25 to be exact) she sees on the streets of London. This print comes in two sizes. 14″ X 11″ at $50 in an limited quantity of 500 and in 20″ X 16″ at $200 in an edition of 50 prints. Thanks to Tim T. for this great find! This entry was posted in Art, Decor, Miscellaneous and tagged Art, christine berry, lambretta, models, poster, scooter, vespa by Tracy. Bookmark the permalink.